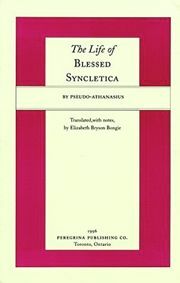 The spiritual wisdom of St. Syncletica was deemed worthy of inclusion by the compilers of the the various collections of The Sayings of the Desert Fathers. Her name has become part of the anchoritic tradition and renewed attention has been focused on her due the recent surge of interest in all matters to do with women. Softcover. 90 pgs.